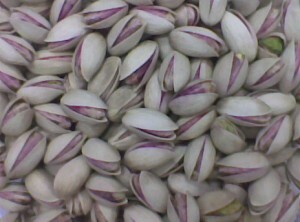 Pistachios are edible green seeds found inside the hard, naturally beiged colored shell that grows on the pistachio (Pistacia vera) tree. The tree is one of the world’s oldest flowering nut trees, with consumption of the nuts dating back as far as 6760 BC. The pistachio, Pistacia vera, a member of the cashew family, is a small tree originally from central. Asia and the Middle East. 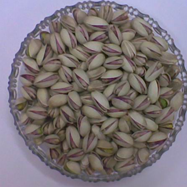 Pistachio trees can be found in region of Iran, Syria, Lebanon, Turkey, Greece, Tunisia, Kyrgyzstan, Tajikistan, Turkmenistan, India, Pakistan, Egypt, Italy (Sicily), Uzbekistan, Afghanistan (especially in the provinces of Samangan and Badghis), and the United States, specifically in California. The tree produces a seed. Pistacia vera often is confused with other species in the genus Pistacia that are also known as pistachio. These species can be distinguished from P. vera by their geographic distributions (in the wild), and their seeds which are much smaller and have a shell that is not hard. 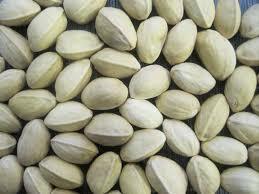 Pistachios grow well under hot, dry climates with cool winters. They are currently being cultivated in large scale in the orchards in the USA, Iran, Greece, Syria, Turkey, and China. After plantation, it takes approximately eight to ten years until it produces its first major crop. Once established, it keeps bearing fruits for centuries. The bush grows up to 10 metres (33 ft) tall. It has deciduous pinnate leaves 10–20 centimetres (4–8 inches) long. The plants are dioecious, with separate male and female trees. The flowers are apetalousand unisexual, and borne in panicles. The fruit, in fact, is a drupe (a fruit with a large, central located single seed), and the seed kernel is actually the edible portion. The seed, commonly thought of as a nut, is a culinary nut, not a botanical nut. The fruit has a hard, whitish exterior shell. The seed has a mauvish skin and light green flesh, with a distinctive flavor. When the fruit ripens, the shell changes from green to an autumnal yellow/red, and abruptly splits part way open. This is known as dehiscence, and happens with an audible pop. The split open is a trait that has been selected by humans. Commercial cultivars vary in how consistently they split open.